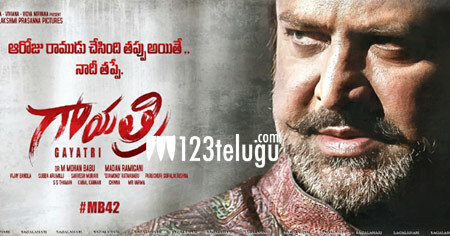 Legendary actor, Mohan Babu is back to the silver screen after a long gap with his latest film Gayatri. He plays a double role in this film and will be seen as a bad guy in one of the roles. Mohan Babu’s mannerisms and dialogues are set to be a special attraction in the film which has garnered quite a decent buzz because of the hard-hitting trailer. The film is getting a decent release all over and special premieres are being aired in the US for the film. Touted to be an emotional drama, this film is directed by Madan. Vishnu Manchu will be seen in a guest role in this film which is based on the character of Gayatri which is played by Nikhila Vimal. Thaman scores music.